Not wishing to steal Scion's thunder or anything but I thought I should set this up. Essentially if youwish to help in the creation of a Druchii.net campaign then sign up here and put what your willing/able to help with. Also bear in mind that if you decide to help out in its creation you are unlikely to be able to take an active role in playing the campaign. I can help but I cant guarantee to be on line at any specific times and I cant use the chat. I also volunteer to help. Background, rules and mechanics as well as organising stuff. I'd like to volunteer to help with background and any story writing needed. I can volunteer to help with advice and/or criticisms on the various things you guys come up with. If I have any ideas for stuff, I'll post them, but I'm not very creative. Bored Life: Forum for RPs and general discussion in need of new blood. PM for details. Components of an online campaign? List what skills you have, and we can work from there. I can do Army list creation and story and fluff creation. I could also do some modding despite no previous experience. I have been around here long enough to see how its done. Someone with the skills to manage the website for the campaign is the biggie as that is the job which requires specific skills. I can do Army list creation (that is what I am best known for), Background and Moderating as well as promoting the thing and establishing contact with other sites whose members we would like to include. Programing and Web design is unfortunately something that I dare not dabble with since it has been 8 years since I tried to write something. On that note, there's a limit on what we can do here. We can offer you announcements and forums, but if you require anything technical in addition to that, you'll have to find a way to create that off-site. These are my old campaign rules that I have posted a few times. I can make maps as required in paint. Stories abound of the treasures the old ones that can be found deep in the Lustra jungle. One such story has come to light. The amazon who carried the story released it in parts as she traveled accoss the old world from, Cathay to Brettonia, to pay her way, in her efforts to get back home. The story is on an item so powerful that it can be used to travel anywhere in the world, and beyond to the plains of the gods. Currently it resides in an temple deep in the Lustra jungle on a lake. The lake and the surrounds are within a volcanic crater with only limited paths in and out. Entrepenurs from across the old world have created expeditions to find this temple, and take vcontrol of the power within. A unit is a brood, pack, mob, squad, herd, independent character, war machine or monster. A group or grouping is a collection of units trying to do the same thing. Strength is the number of wounds worth of monsters or personnel/beasties – War machines do not count toward strength calculations. Each side starts with 2,500 points of troops and characters which at this point are not required to conform to an organisational table. The units to be used are chosen before the start of the campaign, and remain fixed, except as described below. 1) Unit organisations are fixed except for reduction due to casualties and amalgamation of units below minimum size. A unit that has fallen below its minimum strength may be amalgamated with another unit of the same type if the resultant unit does not exceed the maximum allowed size of that unit or cause it to have more attributes than it is entitled to (standards, musos, etc.). 2) The following criteria apply to the forces that wish to initiate combat. ¨	The force cannot exceed 1250 points. ¨	The force must be legal by the WHFB rule book or by the warbands rule if below 500 points. 3) If a grouping does not comply with either of the above criteria, neither it nor any of its component units can enter a hex containing enemy units. If brought to combat by enemy units entering its hex, up to 1250 points of the force may be deployed. Any models that cannot be deployed due to exceeding the 1250 point limit are destroyed if their side is forced to leave the hex. Movement. Strategic movement is plotted, secret and simultaneous. Movement ends when a hex containing enemy units is entered. Combats do not occur across hex edges, when this might be the case each side rolls 1xD6 – the lowest roll becoming the defender. 1) All units have 3 movement points to use for movement each turn. ¨	River hexes without a bridge cost 3 movement points to enter. 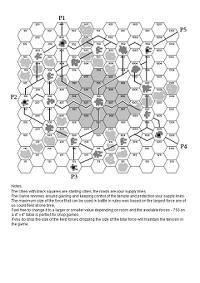 ¨	City hexes being entered from a non-road hex cost 3 movement points to enter. ¨	Causeways cost 0 movement points to cross - hexes on either side of a causeway count as adjacent. 2) Lake hexes are impassable to all units. Supply. During the supply phase of the strategic turn, units replace used ammunition and other expendable items. Supply is traced primarily along roads - only two of the hex sides that supply is traced through may be without roads also passing through them. ¨	The supply source for each side is the road they arrived on. ¨	Supply is traced from the unit to the supply source and does not include the hex the unit currently occupies. Note: even all mounted or all flying forces move 3 strategically, as their logistics are still using wagons, slaves, pack animals, etc. Blocking Supply. Hexes containing enemy units blocks supply even if units from the side that wishes to trace supply through the hex are also present..
¨	At least one of the units in a hex blocking supply must be present on the table the start of a battle for the hex (they can’t all arrive later via specail rules). Out of Supply. Out of supply units may move and fight normally within a hex but cannot leave it. They operate under the following limitations. ¨	Units driven out of their hex while out of supply are destroyed. ¨	Units reorganising while out of supply subtract one D6 from the number of rolls they get per 10 wounds, if reduced to zero they get none of their losses back. If a unit is completely surrounded by enemy controlled hexes and forced to retreat from its current hex, the unit is destroyed. Combats use the WHFB ruless. Battles are fought on a 4’ X 4’ table. Retreat From Combat. For a group to retreat from an ongoing combat it must be on or have reached the table edge most adjacent to a hex not occupied by enemy units and then successfully move off the table into that hex. Units surrounded by enemy occupied hexes or that are forced to cross a causeway are instead destroyed. Reorganising After Combat. Reorganisation includes recruiting locally, rounding up strays, making repairs and the arrival of replacements. 1) The side which drove off, captured or destroyed all of the enemy units that were on the table, rolls 3xD6 for each 10 wounds (rounding up) suffered by its force and removes that number of wounds from its destroyed or damaged models and repairs all damage to its vehicles. 2) If both forces still had units on table when the game ended, roll 2xD6 for each 10 wounds (rounding up) suffered by each force and remove that number of wounds from destroyed or damaged models of that side. 3) Sides which were driven off table roll 1xD6 for each 10 wounds (rounding up) suffered by its force and removes that number of wounds from its destroyed or damaged models. If driven across a causeway they instead remove 1xD3 wounds. 4) Add +1 to the result of any reorganisation number rolled for each city that a side is the undisputed occupier of. 1) Map rivers appear on the table. 2) Use the terrain generator from rulebook to place terrain if the players cannot agree on a suitable terrain set-up. Victory conditions. Victory goes to the player who delivers a relic to the temple. It is obvious which unit is carrying the relic because of the energy it emits. 1) The relic will prevent its transferee from one unit to another other than by the total destruction of the unit carrying it - the relic cannot be destroyed by any means. 2) The relic can be captured by killing/destroying the unit carrying the relic. When the unit is destroyed, the relic is placed where the last model died, and remains there until picked up by another model. The unit of the model that picks up the relic – if it has one – is then tasked with delivering it to the central island temple. The relic. Somewhere within the crater is the relic which triggers the teleport device within the temple. Each turn that one or more of a players’ unit is in uncontested occupation of a ruined city, roll 2xD6, on the roll of 2 the relic has been found by one of the searchers within the city. ¨	Only traineed and trusted searchers are looking for the relics, so the number of grubby untrustworthy troops with the ruins has no effect on the search roll. ¨	If more than one “2” rolled in the same turn, then those players roll off until there is only one with the relic. ¨	The powerful emissions when the relic is found will be obvious to all of the mages within the crater. The Temple. The temple occupies a table edge of the hex in the centre of the lake. The campaign ends when a unit with the relic reaches the platform of the temple, the owner of the unit delivering the relic being the winner. I can help out on the programming/web development section, but time being a limiting factor, I don't do deadlines on voluntary after hours basis (I need a normal life too) so I'll need plenty of time (well, not plenty, just enough). Getting an artist on board might also be nice, cause I'm a developer, not a designer. As far as I know (and that is not too much), a group of programmers / web designers work better than one. Anybody else have experience in this field? And for the sake of not simply Googling pictures, an artist would be spectacular. Understanding time is an issue for most people, this project is still a ways off. Do not feel rushed or pressured, especially at this point. Don't worry too much about the amount of work, thanks to current open source software like wordpress and joomla and others setting up a website is a breeze. If needed, I can knock things up VERY quickly for no cost. It's when you want custom programming when the real headaches start. So what do you think you need exactly? Than I can give an estimate about the amount of work required, and if having more technical people is a must or a nice-to-have. We'll definitly need an artist though (very important if you want to avoid copyright headaches), can't believe there aren't any on this site? Maybe nobody reads this forum? I'll stay out of the rules design, because I lack the time actually playing. Which I find a shame, but which gives me the opportunity to participate in the design more. Looking forward to helping out. Bare minimum is a web page with the map that can be updated regularly (at least once a week). Things which would be nice to have is a page for background which can again be updated regularly as the campaign progresses, possibly a download page for any specific campaign WHFB rules we create and a forum but hopefully Druchii.net has us covered on that last one. Thats all I can think of for now, did I miss anything? That shouldn't be a problem at all for one person. Give me a shout when you want this thing to take off! Sorry if this is resurrecting an old topic, I do think that this is a great idea however and have only just noticed it (goodness knows why?!). Fingol - do you have any more news buddy? Seems we've filled all the basic requirements - hope someone replies to this soon! Hi, i'm Malekii but you can call me My Lord. Maybe you could have people "invest" thier wins in territories and the army with the most Invested wins claims the territory. I'm still up for doing this although seeing as I am in my last year of school I wouldn't really be able to involve myself in organising it properly until late May but if we can get an interested team together then I'll be all for it. In the mean time Animosity 5 is just about to start and should be great fun so please get involved with that. I am stil here. I have some university stuff now and am completing a major project but just as Fingol I will be availabe in May to get the thing started with a potential timetable for Christmass/New Year 2011. Cool! I'm quitting my job soon so will try and start coming up with some nifty ideas!